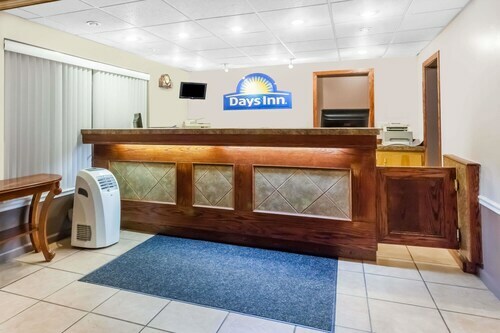 Situated in Tannersville, this hotel is within 3 mi (5 km) of The Crossings Premium Outlets, Camelbeach Mountain Waterpark, and Great Wolf Lodge Waterpark. Aquatopia is 2.7 mi (4.3 km) away. Situated in the mountains, this hotel is within 3 mi (5 km) of The Crossings Premium Outlets, Great Wolf Lodge Waterpark, and Aquatopia. Camelbeach Mountain Waterpark and Camelback Ski Area are also within 6 mi (10 km). 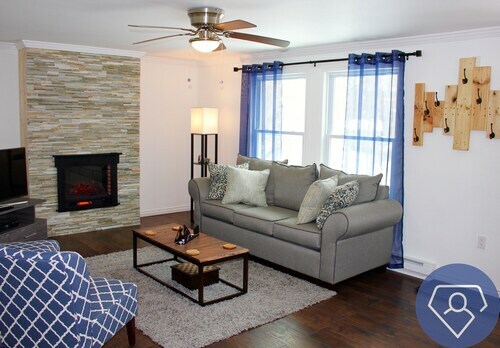 This family-friendly Tannersville vacation home is within 2 mi (3 km) of The Crossings Premium Outlets and Aquatopia. Camelbeach Mountain Waterpark and Camelback Ski Area are also within 3 mi (5 km). This family-friendly Tannersville vacation home is within 3 mi (5 km) of The Crossings Premium Outlets, Great Wolf Lodge Waterpark, and Aquatopia. Camelbeach Mountain Waterpark and Camelback Ski Area are also within 6 mi (10 km). Camelback/pocono Luxe Escape W/fire Pit & Hot Tub! 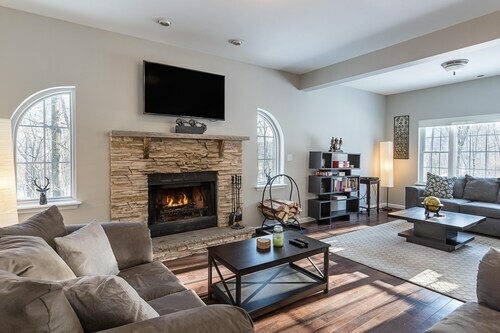 Located in the heart of Tannersville, this vacation home is within 3 mi (5 km) of The Crossings Premium Outlets, Great Wolf Lodge Waterpark, and Aquatopia. Camelbeach Mountain Waterpark and Camelback Ski Area are also within 6 mi (10 km). Situated in Henryville, this vacation home is 1.6 mi (2.6 km) from Great Wolf Lodge Waterpark and 1.9 mi (3.1 km) from The Crossings Premium Outlets. Camelbeach Mountain Waterpark and Camelback Ski Area are also within 6 mi (10 km). Situated in the mountains, this hotel is within 1 mi (2 km) of Aquatopia and Camelback Ski Area. Sherman Theater and East Stroudsburg University are also within 16 mi (25 km). 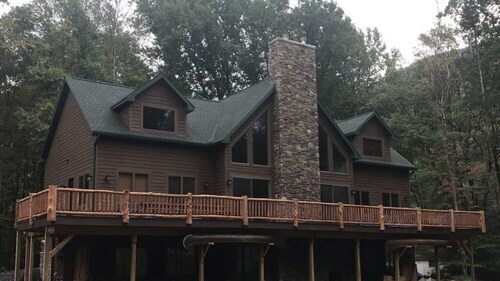 Situated in Tannersville, this vacation home is 1.4 mi (2.2 km) from The Crossings Premium Outlets and 2.8 mi (4.5 km) from Great Wolf Lodge Waterpark. Camelbeach Mountain Waterpark and Camelback Ski Area are also within 6 mi (10 km). Booking Proms Big Pocono Lodge @camelback W/indoor Waterpark Passes Available! This family-friendly Tannersville vacation home is within 2 mi (3 km) of Aquatopia, Camelbeach Mountain Waterpark, and Camelback Ski Area. The Crossings Premium Outlets is 1.6 mi (2.6 km) away. This family-friendly Tannersville vacation home is within 2 mi (3 km) of Aquatopia, Camelbeach Mountain Waterpark, and Camelback Ski Area. The Crossings Premium Outlets is 1.6 mi (2.5 km) away. A visit to The Crossings Premium Outlets is bound to be a fascinating experience. You can visit it by making your way to Tannersville, 90 miles (145 kilometers) outside of the state capital, Harrisburg. There's a great range of 5 hotels within 2 miles (3 kilometers) of The Crossings Premium Outlets, but it still pays to make your reservation ahead of time. Discerning travelers like the Great Wolf Lodge Pocono Mountains, PA, Best Western Plus Poconos Hotel and Days Inn Tannersville, 1 mile (2 kilometers), 0.5 miles (0.8 kilometers) and 0.4 miles (0.6 kilometers) away, respectively. It won't take very long to book one of the area's more reasonably priced hotels. Why not choose one of the Comfort Inn And Suites and the Hotel M Mount Pocono? If you want to spoil yourself for a few nights, you ought to look up the Mount Airy Casino and Resort. Located 5 miles (8 kilometers) away, it's the only top-end hotel in the area. Conveniently located nearby, Dunkin' Donuts is well-known as a great place to replenish your energy levels. Also close by is Romano's Pizzeria, a nice establishment that offers a selection of mouth-watering meals. At the end of your day, raise a glass to cherished memories that you've made at Log Cabin Bar and Grill, just a few more minutes away. Free up an afternoon and get ready for some action at MagiQuest. 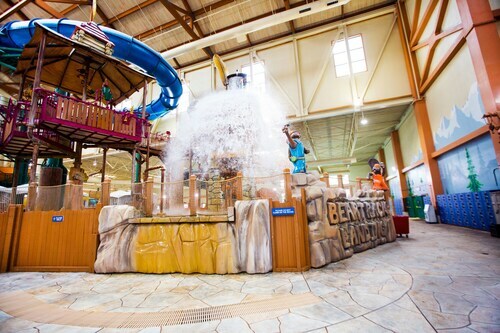 For a fun time out on a summery day, pack your hat and sunscreen and go to Great Wolf Lodge Waterpark. 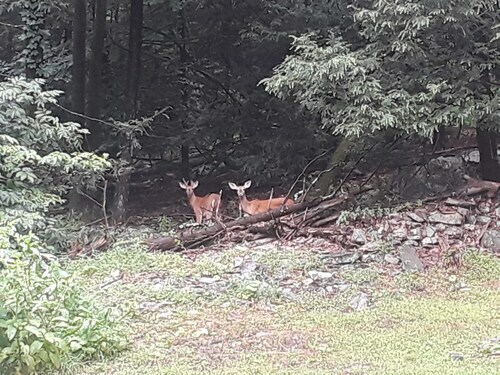 Thoroughly enjoy the sights and sounds of nature as you explore Big Pocono State Park. Sitting high above the forest floor, the treetop walking path of Camelback Mountain Adventures offers its visitors gorgeous views that were once enjoyed only by winged creatures. Camelbeach Mountain Waterpark is a superb water experience. 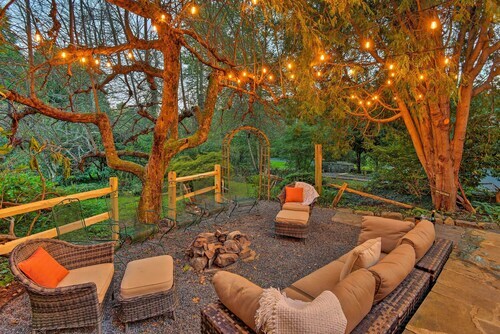 When the temperature rises, this is the ideal location to relax and chill. How Much is a Hotel Room in The Crossings Premium Outlets? Hotels in The Crossings Premium Outlets start at $59 per night. Prices and availability subject to change. Additional terms may apply. Camelback 6000sqft 9 Bedroom Onsite Pool/hot Tub/sauna Plus Amazing Slope View!